In May 2014, we traveled to Wilmington, DE and Philadelphia, PA to do research at the Hagley Museum (Wilmington) and at the National Archives and Records Administration (Philadelphia). Along the way, we stopped at Carney’s Point, New Jersey to check out some of the Aladdin kit homes. There in Carney’s Point, we found an abundance of DuPont Houses (probably DuPont designs, but built with ready-cut materials ordered from Aladdin) and also Aladdin Kit Homes (Aladdin designs and Aladdin materials). One of the models I saw in Carney’s Point that I had never seen before was the Aladdin “Cumberland.” This is such a pedestrian foursquare that I’m now wondering how many of these I’ve overlooked in other places. 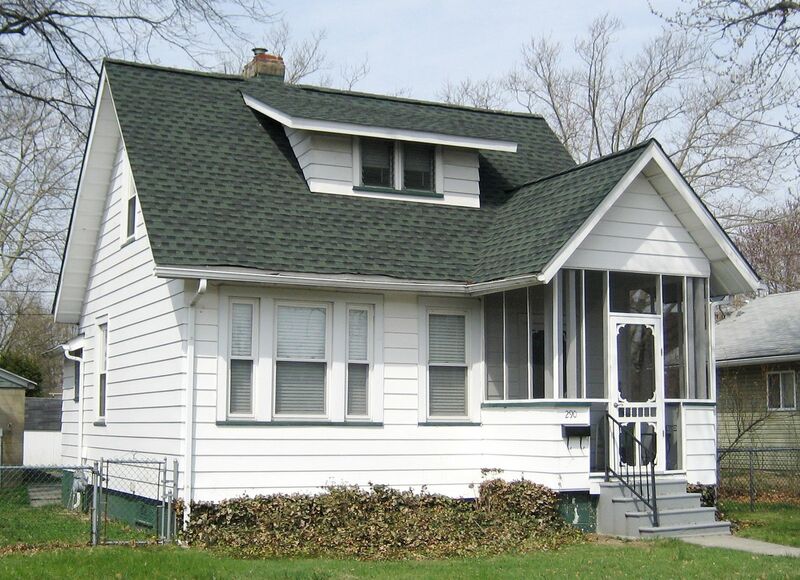 There’s not a lot to distinguish this house from the tens of thousands of foursquares that cover America. 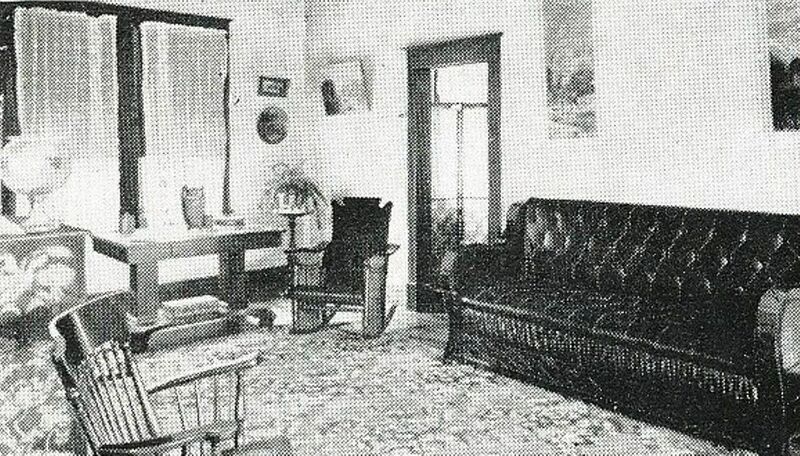 The house was offered in the 1914 and 1916 catalog. 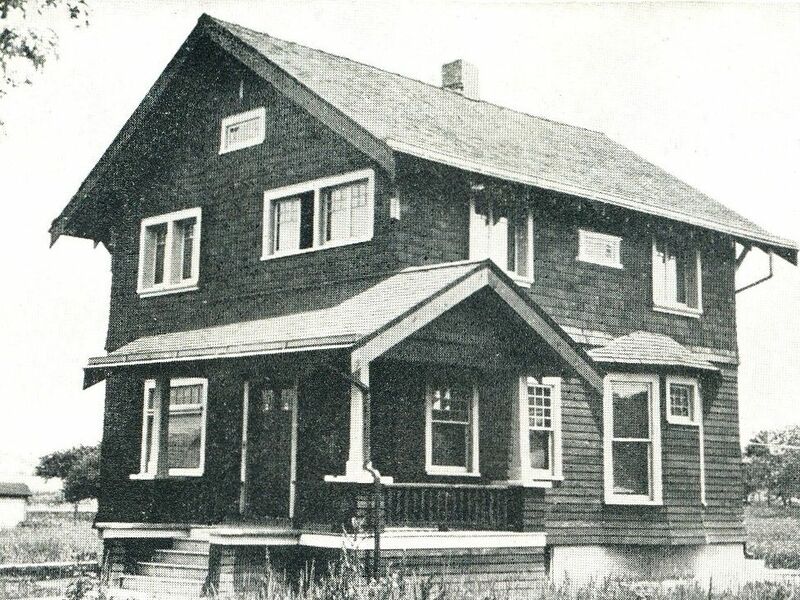 It’s likely that these houses in Carney’s Point were built in 1916, but they’re very close to the 100-year mark! Hopefully, now that I’ve seen one live and in person, I shan’t miss another one! Read about some of the other houses I’ve found in Carney’s Point here, and here. 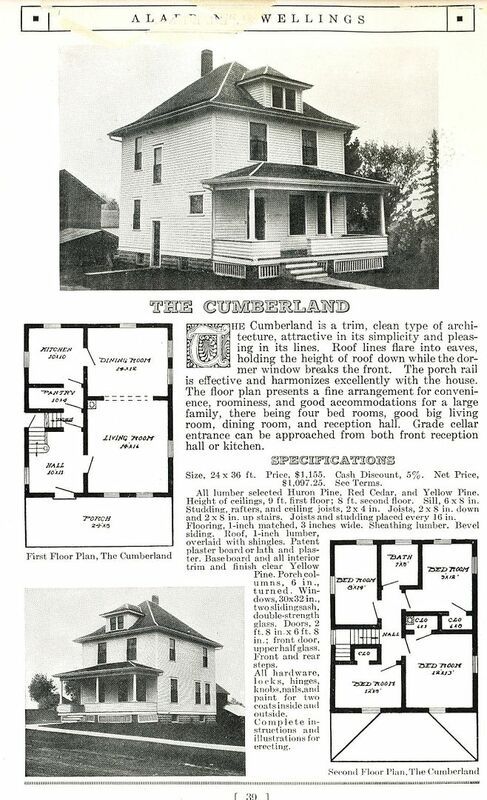 The Cumberland, as seen in the 1914 catalog. View from the staircase side. BTW, the house was built about six minutes ago, and that lattice work uner the porch deck already looks pretty crummy. 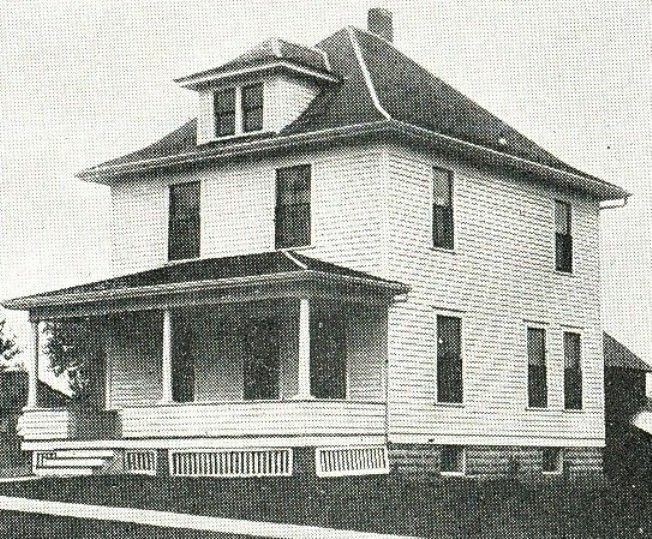 View from another side (1914 catalog). Lattice work looks worse on this side. 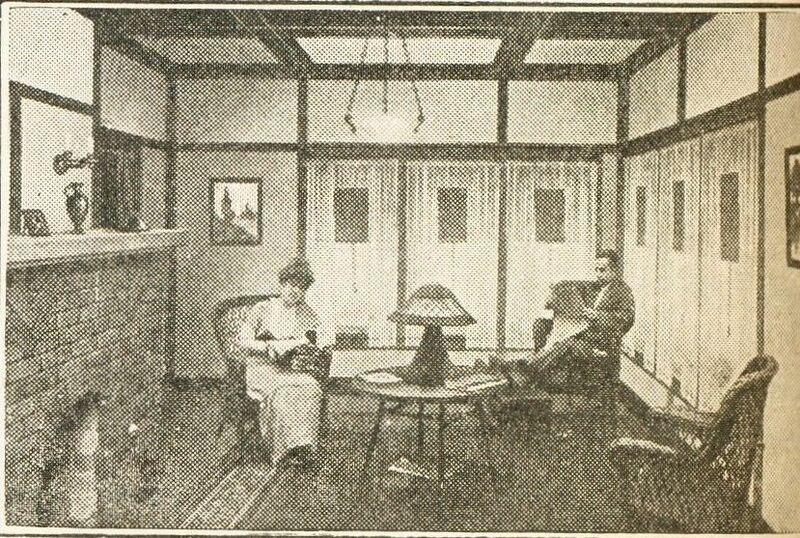 The Cumberland's living room (1916 catalog). Love the couch! 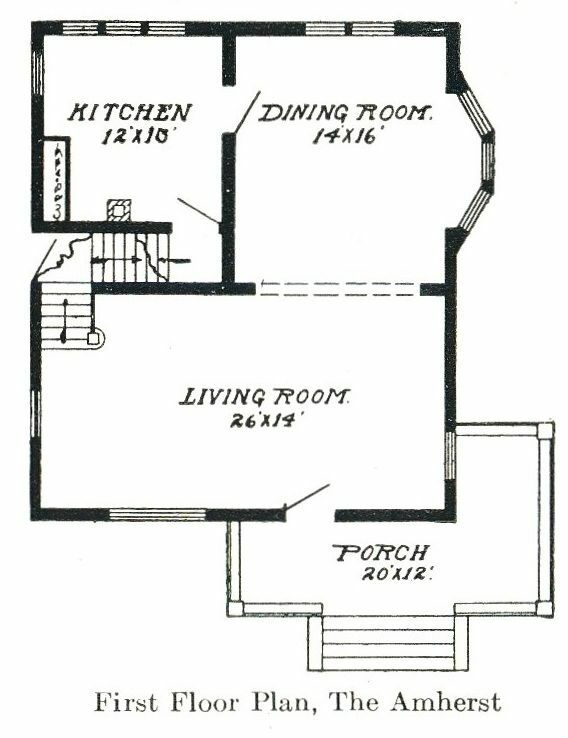 Traditional floorplan for a foursquare (1914). "Sensible" equals uh, well, "pedestrian" (from the 1916 catalog). An undated view of Carney's Point. That's a Cumberland on the far right (foreground). 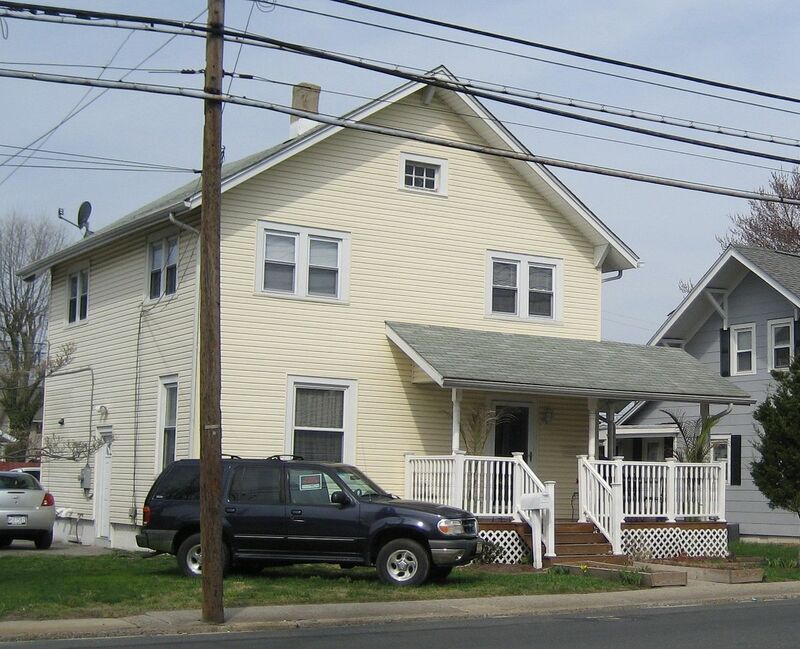 This photo shows why it's so difficult to identify these houses a few decades later! 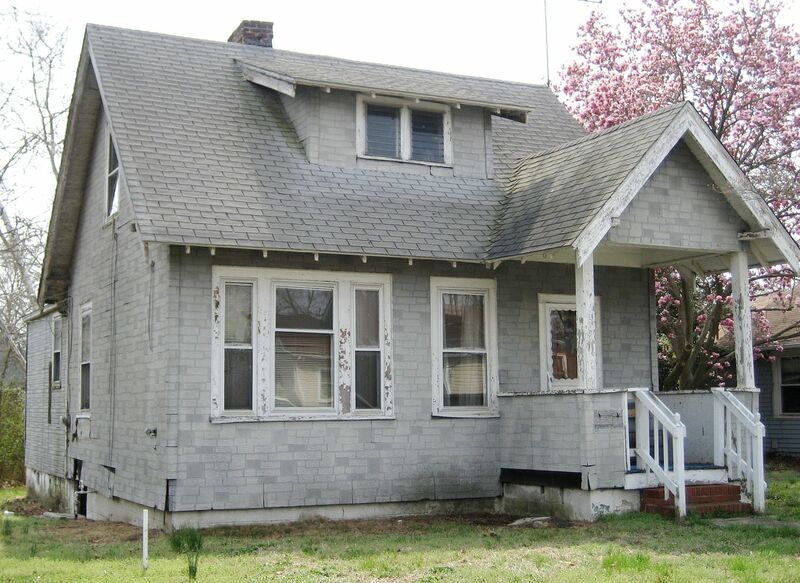 Look at all the changes this house has endured through the years. Three fine windows - gone. At least that crummy lattice work has been repaired. Another Cumberland on Shell Road in Carney's Point. Photo is copyright 2014 Milton H. Crum and may not be used or reproduced without written permission. So there. 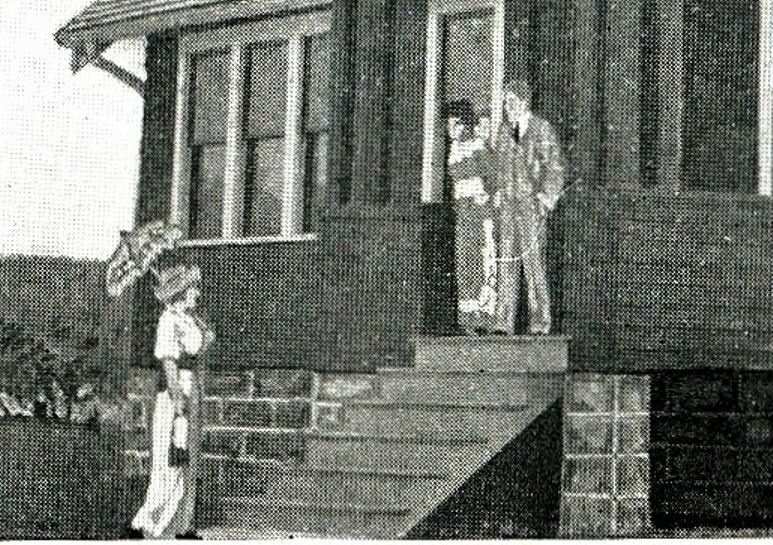 View from the other side (1914). At least this side is a better match to the original catalog image. Photo is copyright 2014 Milton H. Crum and may not be used or reproduced without written permission. 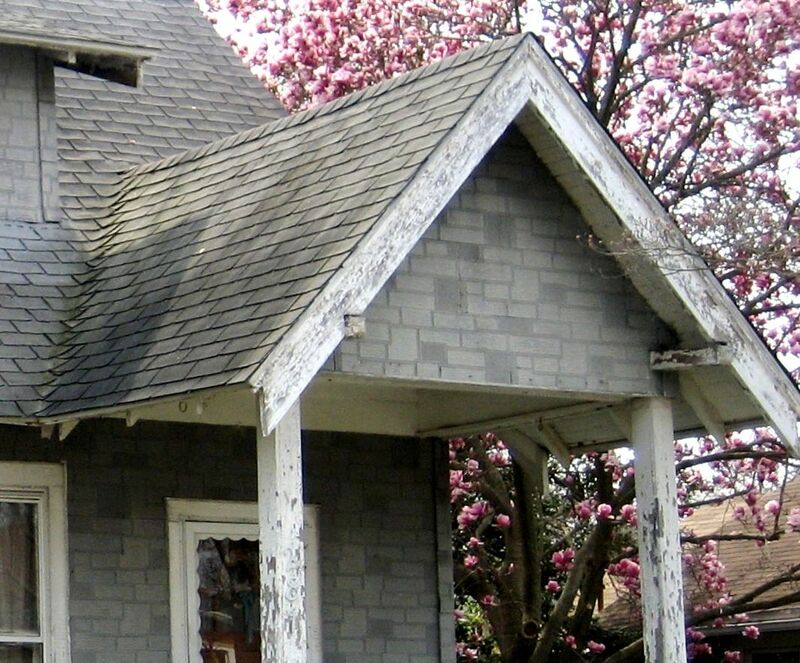 That dormer is unfortunate. Who thought *that* was a good idea? :( Photo is copyright 2014 Milton H. Crum and may not be used or reproduced without written permission. 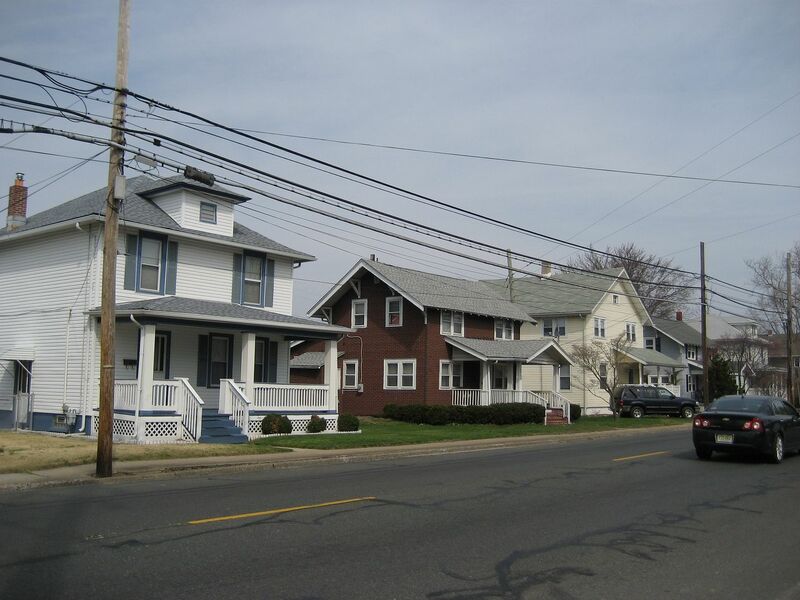 Long view of the many Aladdin kit homes on Shell Road in Carney's Point. In the foreground is an Aladdin Cumberland, followed by an Aladdin Georgia, Aladdin Amherst, Aladdin Gerogia and another Cumberland. Photo is copyright 2014 Milton H. Crum and may not be used or reproduced without written permission. To read more about DuPont and why they were in Carney’s Point, click here. To read about Penniman, Virginia’s Own Ghost City, click here. 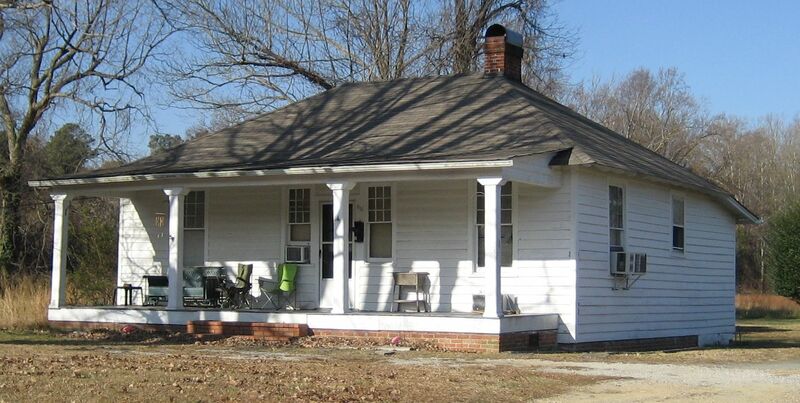 The houses that DuPont built for their munitions workers at Penniman, Virginia featured “Beaverboard” interiors. 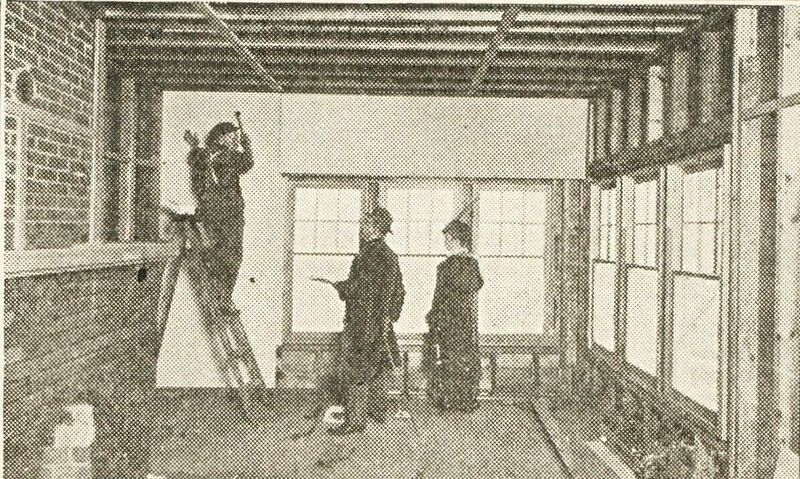 Sounds pretty fancy, but in fact, it was an economical alternative to real plaster walls. 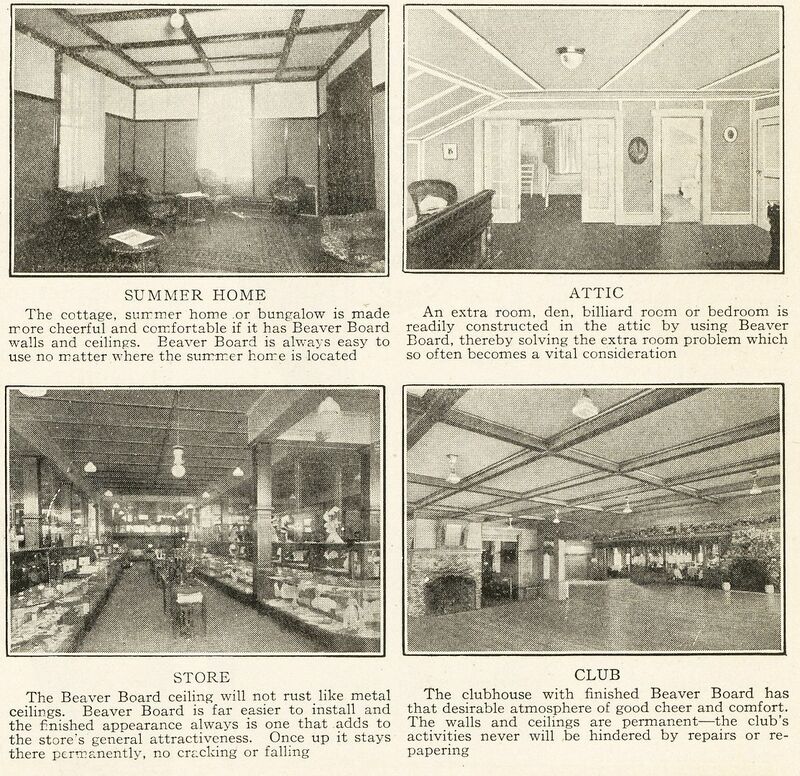 Bill Inge lent me his “Sweet’s Architectural Catalog” (1917) which had a two-page spread on Beaverboard. It answered all my questions (and then some). 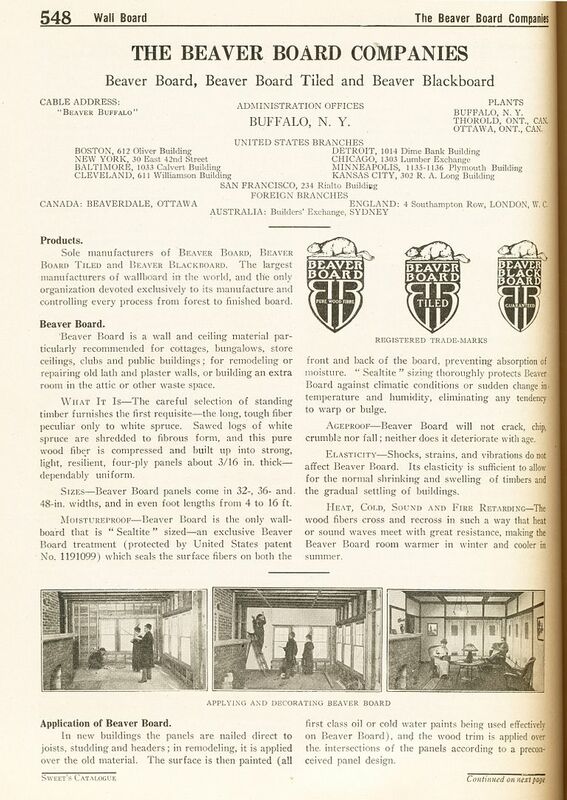 Apparently, this wallboard product was quite the rage in the first years of the 20th Century, and was hugely popular in low-cost industrial housing. 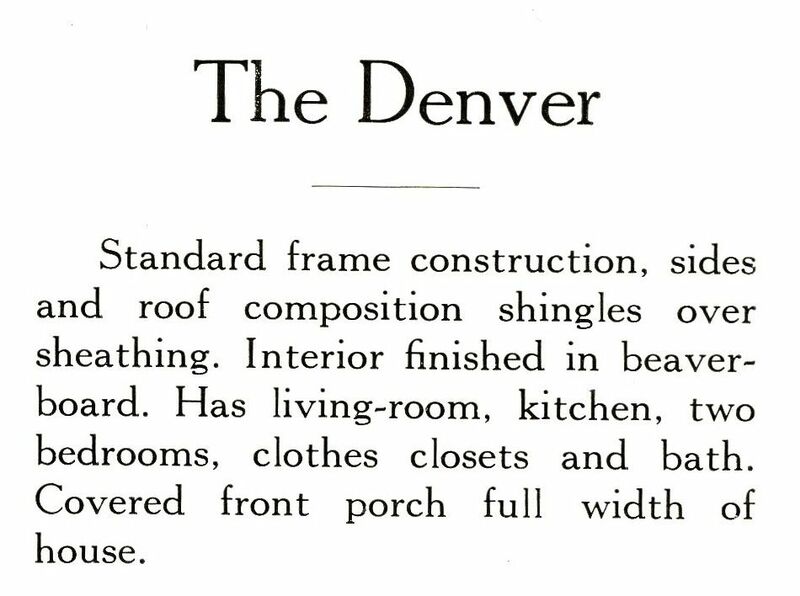 In 1981, our family moved into a house built in 1949, and it had Beaverboard on the walls of its small attic room (complete with 2-inch strips at the seams). When we tore it out, it created a massive mess. 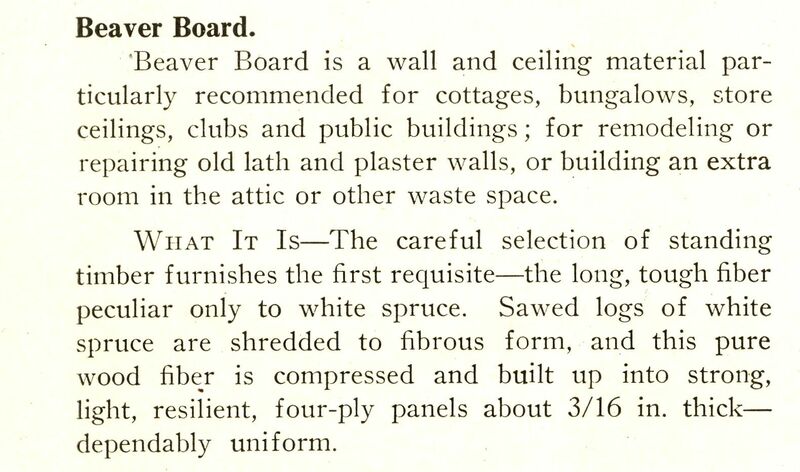 Apparently, Beaverboard wallboard was a product that endured for many years. According to Wikipedia, it can also be used as an artist’s canvas. Grant Wood’s famous painting of the morose farming couple - American Gothic - was painted on a piece of Beaverboard. What made plaster so expensive? Click here. To learn more about industrial housing at DuPont’s villages, click here. Interested in Virginia’s own Ghost City? Click here. 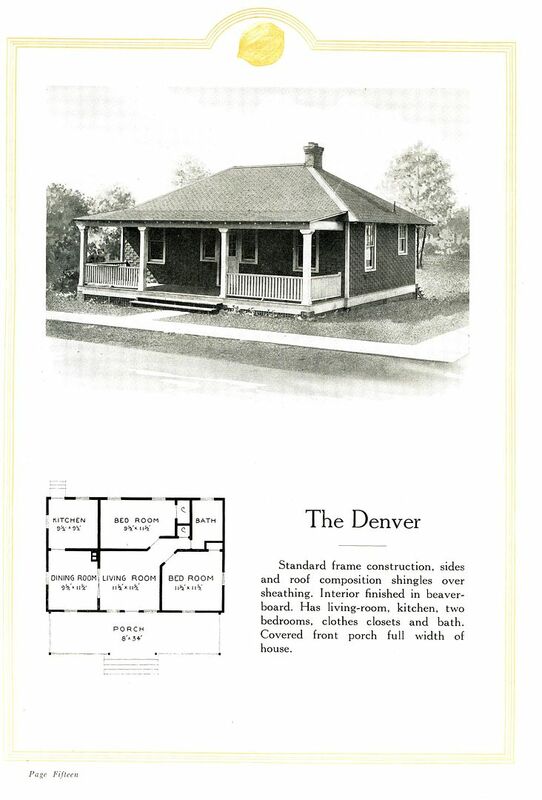 The houses that DuPont built at their munitions plants had beaverboard walls. Despite the glowing reports in the Beaverboard literature, this was still an "economical" alternative to plaster. The header says, "Foreign Branches." Quite an outfit! "Long tough fibers of white spruce...compressed and built up into...panels..."
Is the homeowner weilding a walking stick at the old worker? Now that the worker has started putting up Beaverboard, the walking stick has been removed from sight. Why bother to put six big beautiful windows in a house and then cover them up? Why not just put Beaverboard right over the windows? If I were queen of the world, I'd make it illegal to have a sunporch shrouded in heavy drapes. 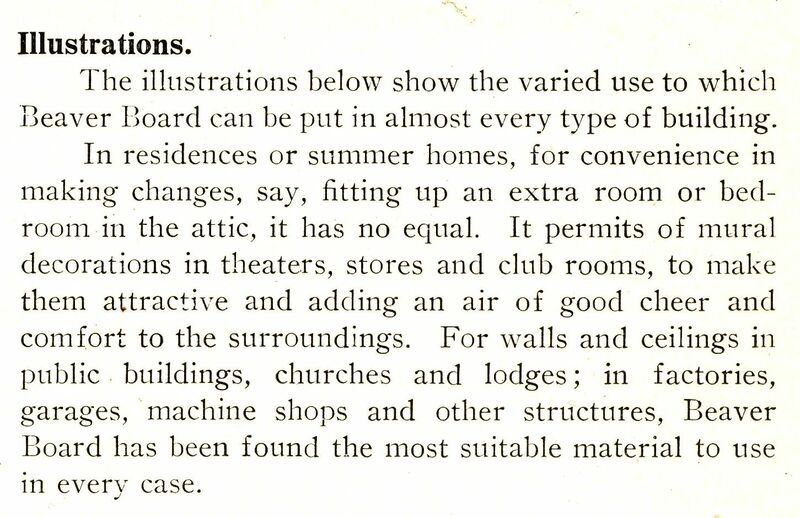 "It permits of mural decorations in theaters..." I have my doubts about this. Under "Club" it reads, "The club's activities never will be hindered by repairs..." Wow. 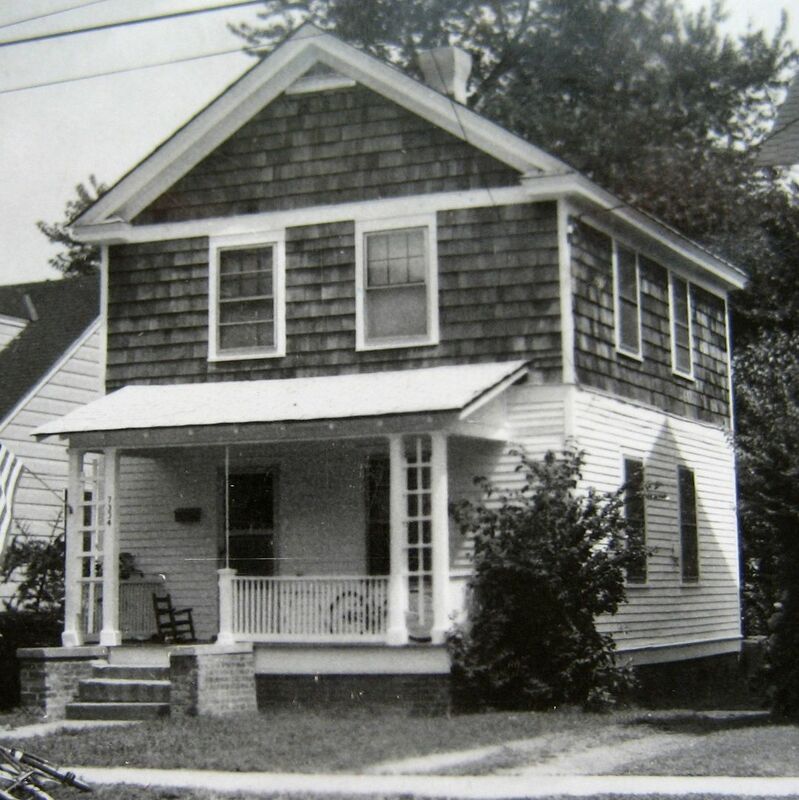 Here's a Penniman house that was moved from the munitions factory to Capitol Landing Road (Williamsburg). 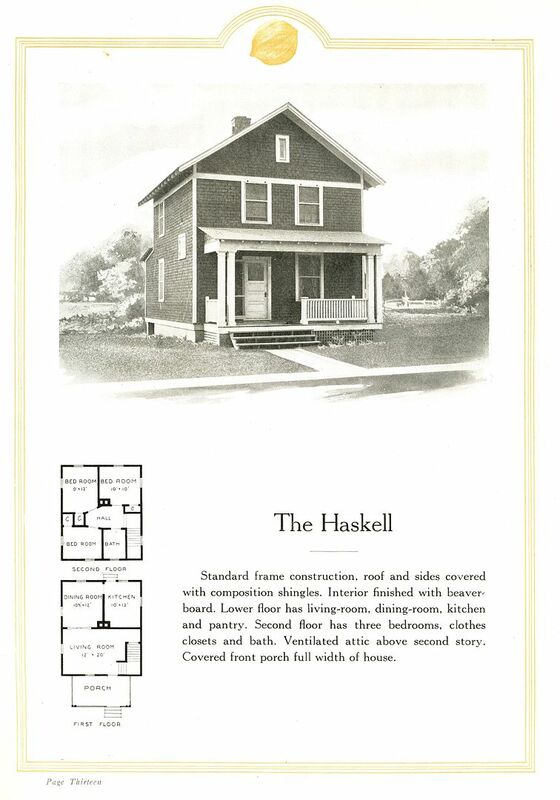 Was it built with interior walls of Beaverboard? Probably so. 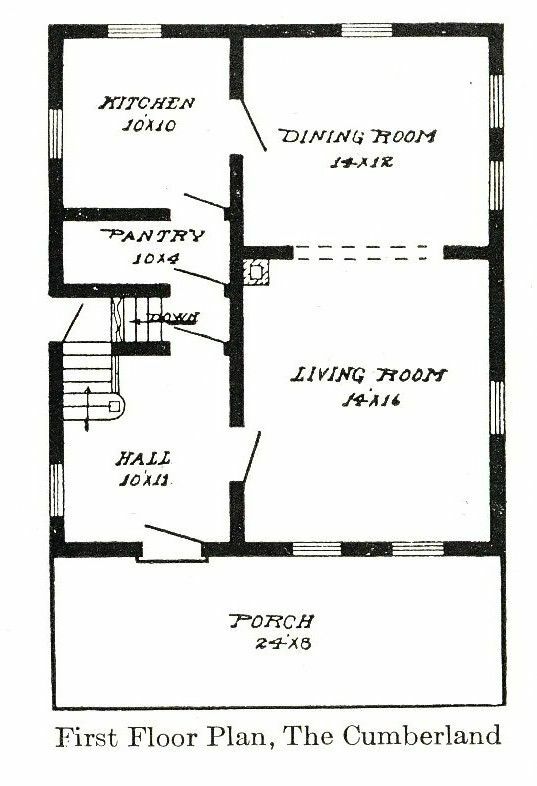 How I'd love to see the inside of this Penniman/DuPont house when built in 1918. Last month, we drove from Norfolk to Philladelphia to visit the National Archives and Records Administration. En route, we took a slight detour to Carney’s Point, NJ to check out the houses in that neighborhood. Carney’s Point, like Penniman, eventually became the site of a World War 1 DuPont munitions plant. 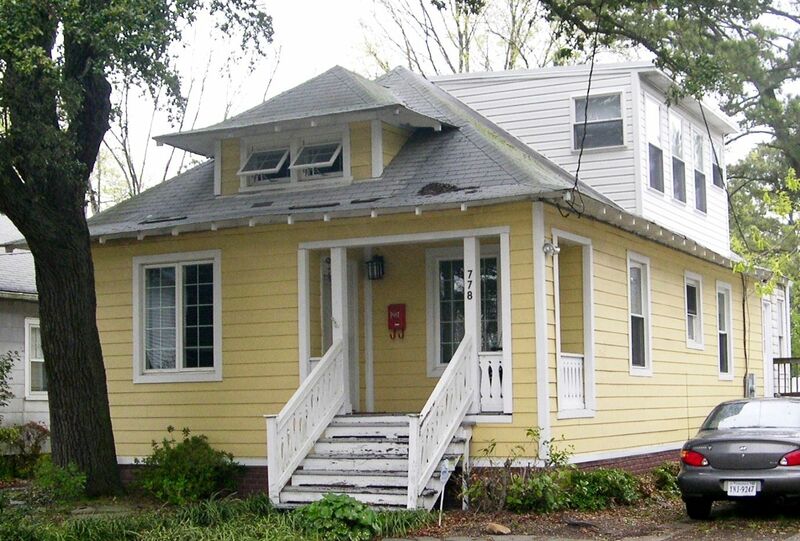 In 1891, E. I. DuPont de Nemours bought the land from the descendant of an Irish immigrant (Thomas Carney). DuPont wanted the 17-mile-square-tract to build a manufacturing plant for one of their best-selling products: smokeless gunpowder. 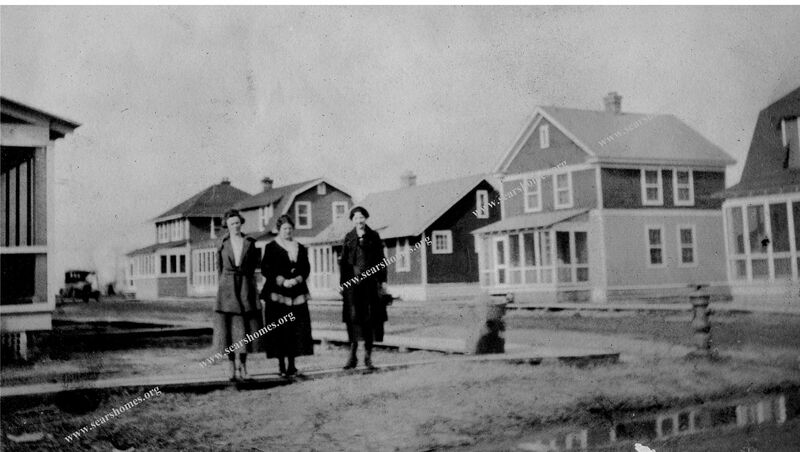 After The European War started, Carney’s Point went from a population of 2,000 (pre-War) to 25,000 (early 1917). In their rush to provide housing for their employees, they turned to Aladdin, and created - literally - a neighborhood full of Aladdin kit homes. We went to Carney’s Point with a photograph in hand and a mission. I wanted to take a photo that replicated a pre-WW1 photo of the same neighborhood. Mark Hardin found this vintage image (see below) and even figured out what street it was on. Milton and I both snapped several photos, trying to re-create the original image from the vintage photo. And his photos came out much better than my own. I hate it when that happens. Actually, I was very grateful to find that his photos had come out so pretty. 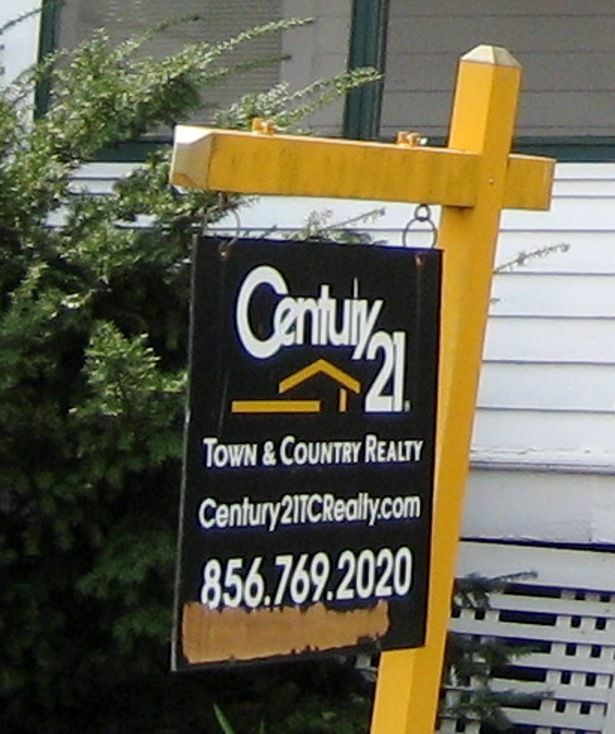 Do the folks in Carney’s Point know that they live in a neighborhood full of Aladdin kit homes? To learn more about Virginia’s Own Ghost City (Penniman), click here. 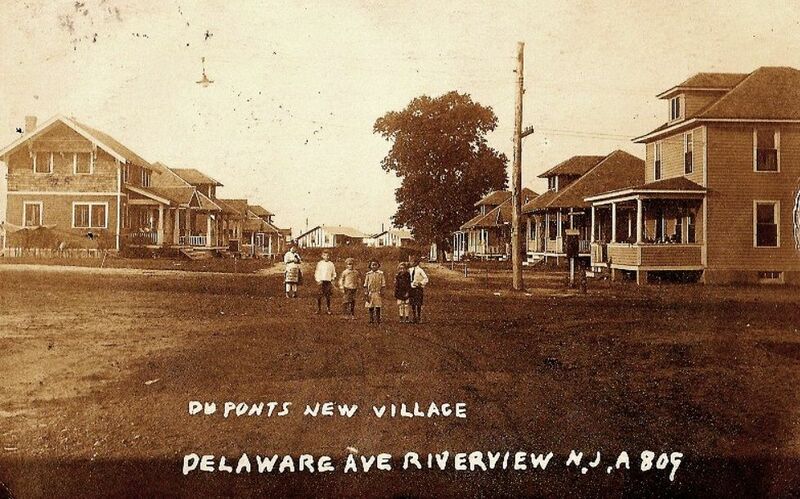 Mark Hardin found this photo of Carney's Point ("DuPont's New Village). 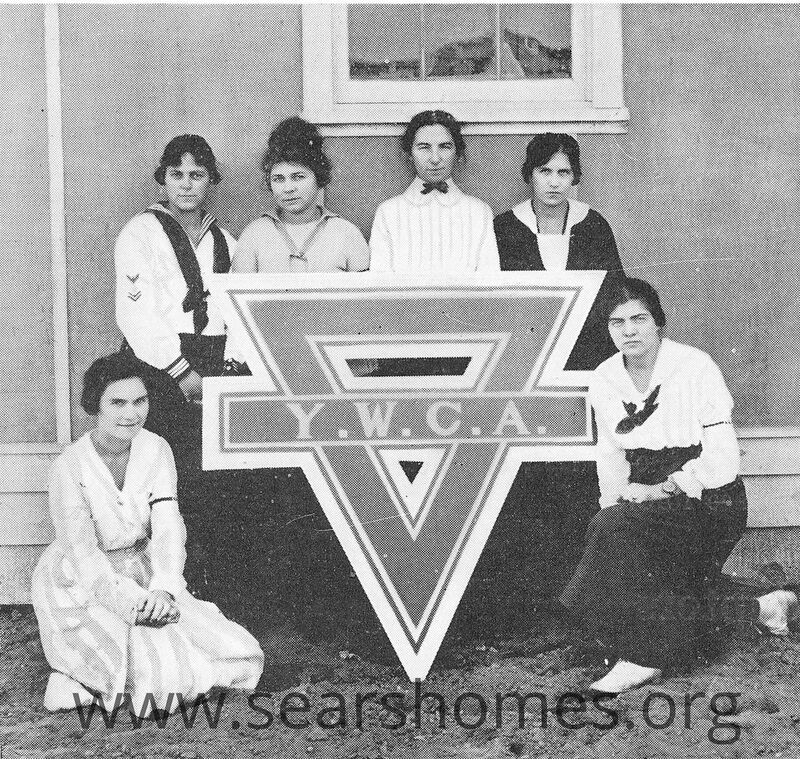 We suspect the photo was taken in the late 1910s. Perhaps someone who's familiar with children's clothing can give a better guess. On the left, is an Aladdin Georgia, followed by an Edison. 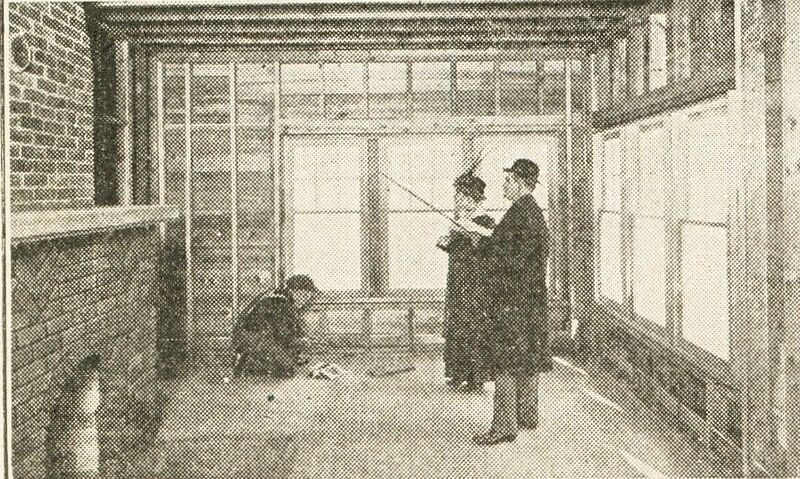 On the right is a Cumberland model, an Edison, a Jackson/Grant, and another Edison. This neighborhood had dozens of Aladdin kit homes. My friend Milton snapped this photo (which came out better than my own photos) and it shows the street view. From our best guess, these photos were taken more than 90 years apart. Photo is credit 2014 Milton H. Crum and may not be used or reproduced without written permission. Side-by-side comparison of the two images. I was hoping some kids might come running out, as it was a beautiful Sunday afternoon, but no kids ever appeared. They were probably inside playing with their Wii or their Ipad or something. Unlike the 1910s, when kids were sent outside and expected to entertain themselves for several hours with a stick and some dirt. 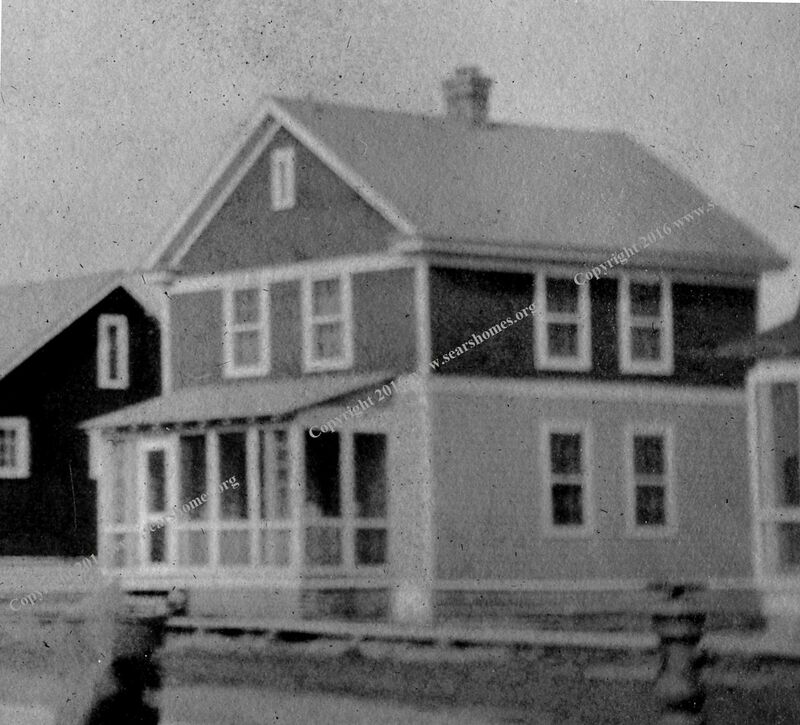 To read about the other cool houses I found in Carney’s Point, click here or here. 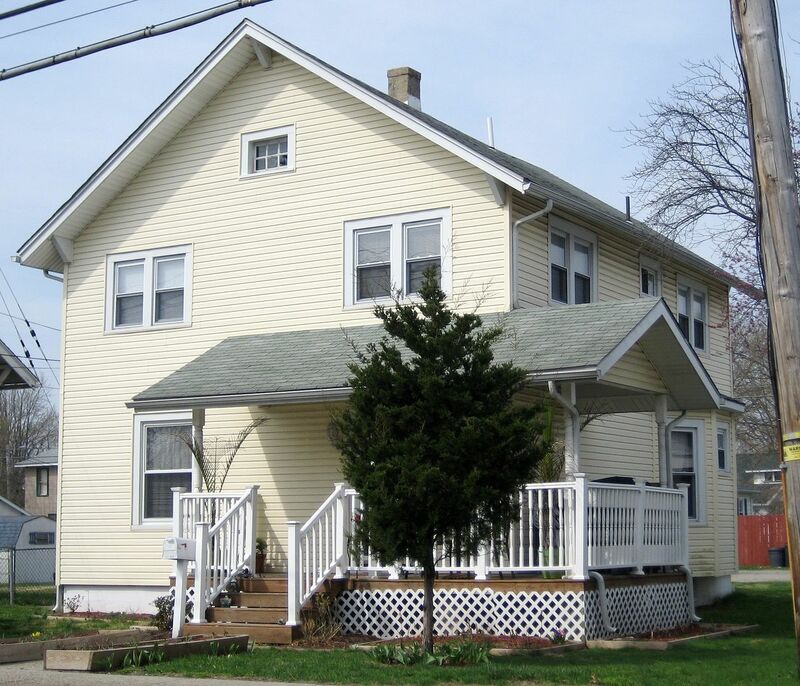 …combined with the advantages of a two-story house! 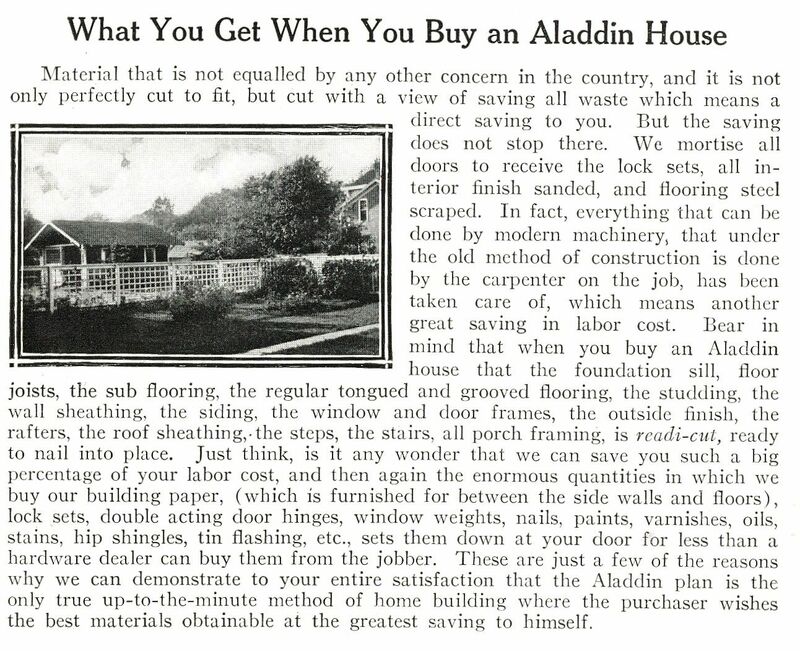 So promised the advertising copy that accompanied the pictures in the 1914 Aladdin Homes catalog. One week ago today, hubby (Wayne) and buddy (Milton) and I were wandering around Carney’s Point, NJ, admiring an entire neighborhood of Aladdin kit homes. In Carney’s Point, I saw several models of Aladdin houses that I had never seen before. The fun started along Shell Road (the main drag through town), where I found several Aladdin houses, many of which were in very good condition. Since returning home, I’ve read through two books detailing the history of Carney’s Point, but neither book has so much as a mention about the fact that they’ve got a large neighborhood (more than 100 houses, I’d guess) of Aladdin kit homes. If the do know, where’s the placard? If they don’t, send them a link to this website! 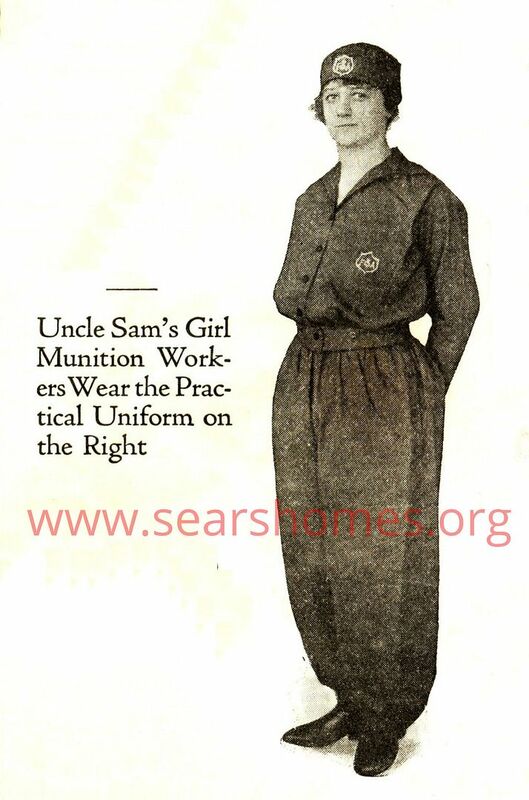 In the 1916 Aladdin catalog, this promotion appeared. Mark Hardin and I have been wondering if Carney's Point (New Jersey) is the town to which they're referring. 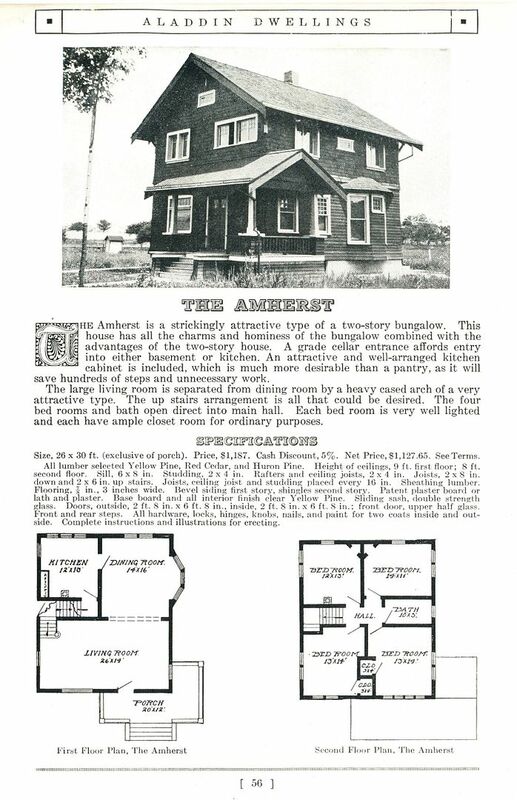 The Amherst appeared in the 1914 catalog. It was not a big seller, but there are several in Carney's Point. All four bedrooms are good size, too. Love the description, complete with the typo! Because it has so many unique features, it should be easy to identify! This Amherst is on Shell Road in Carney's Point. Wish I had the nerve to ask people to move their vehicles, but I don't. 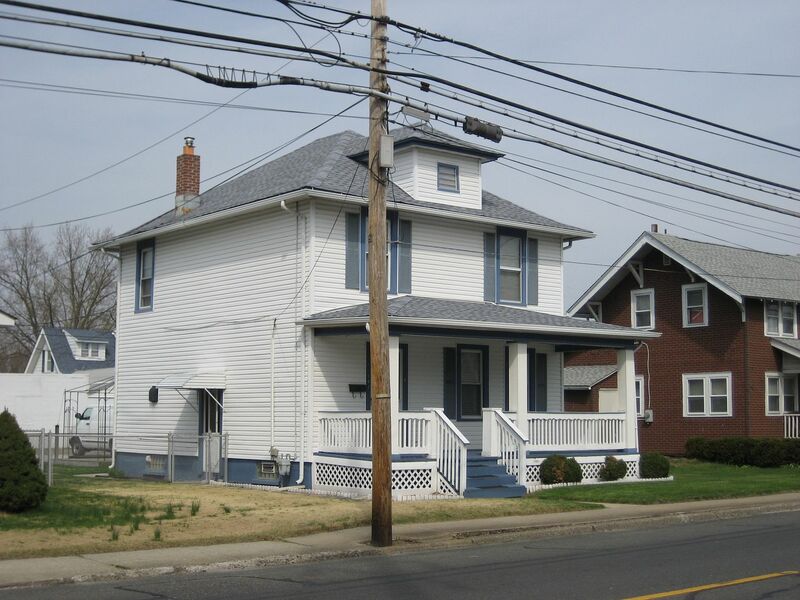 An Amherst in the heart of the Aladdin Neighborhood. 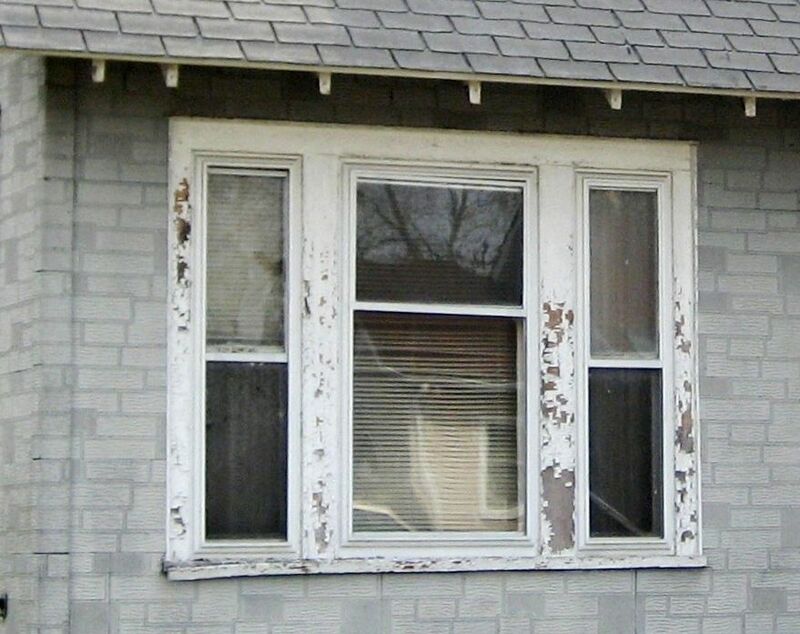 Best feature is, original siding (but replacement windows). Alas! Due to the small lots and mature vegetation, it was hard to get shots that were a good match to the catalog image. Well, let's say it was hard to get good shots and *not* get arrested. This is a good shot of the details down that bay-window side. That funky small window in the bay makes this house *easy* to identify in the wild. Fortunately, I was able to get a good shot of this. 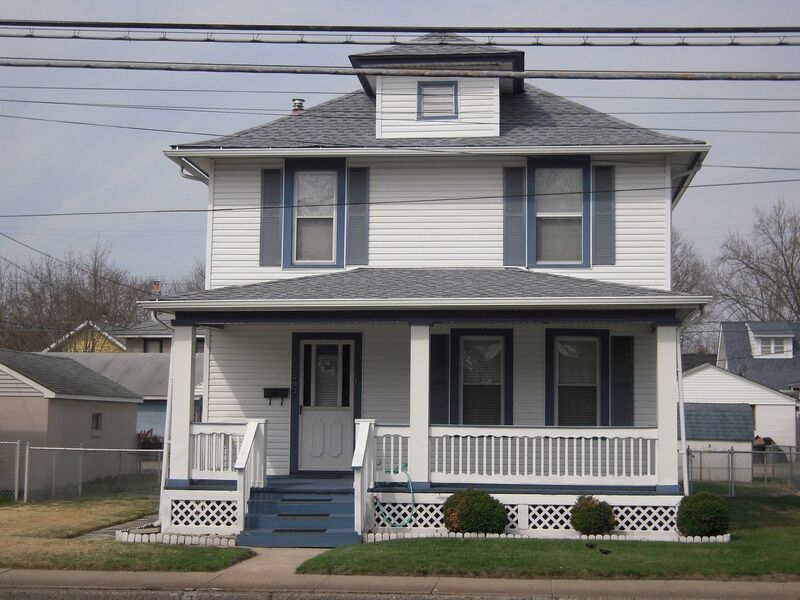 from an angle that matched the catalog, however... That front porch addition is a little "clunky." And what came with your house? 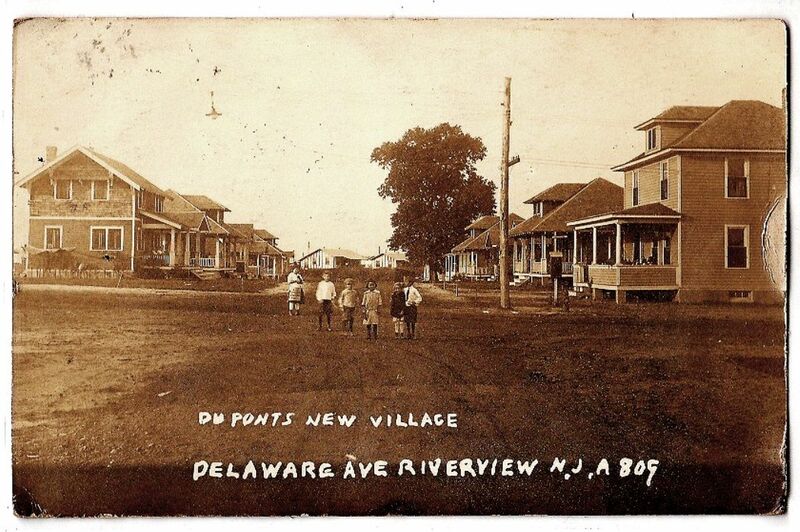 To learn more about another DuPont town, click here. 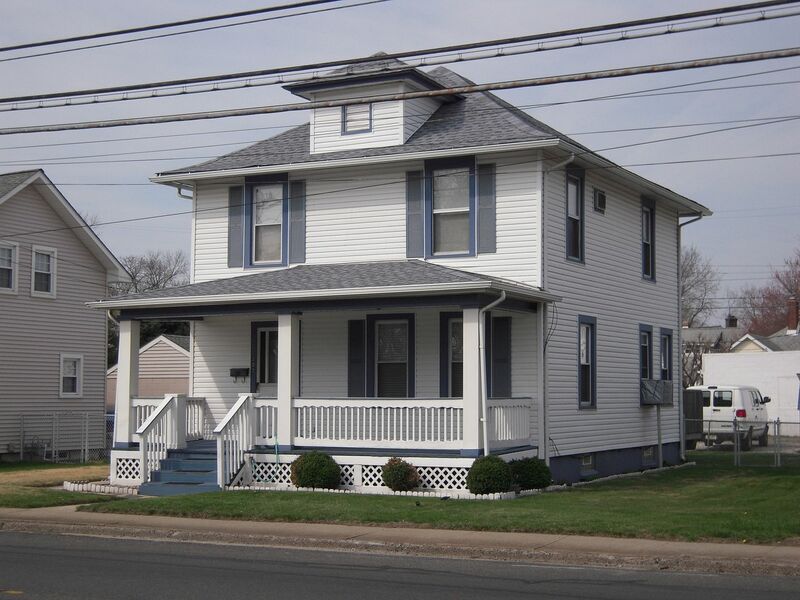 To read about another town filled with Aladdin Homes, click here. Recently, Wayne (hubby), Milton (buddy) and I traveled to the National Archives and Records Administration in Philadelphia to do research on Penniman. 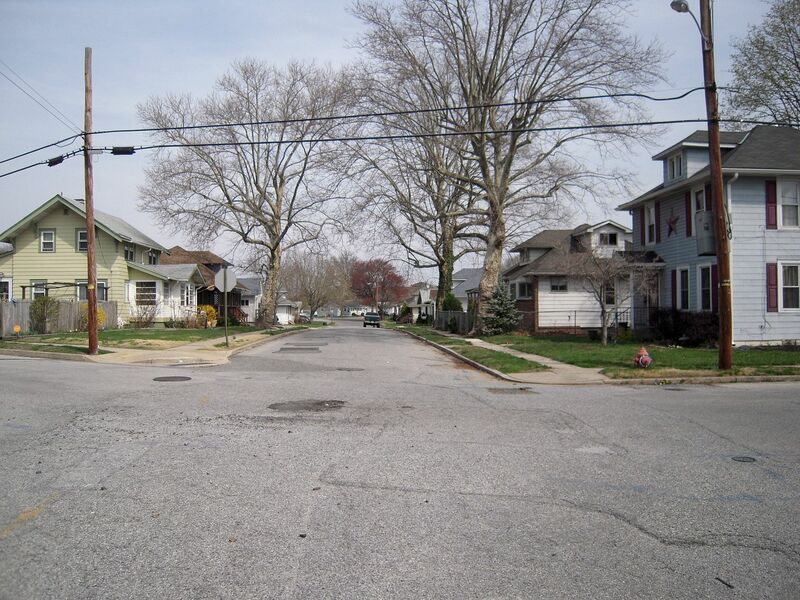 Along the way, we stopped at Carney’s Point, NJ to check out the houses in that neighborhood. Carney’s Point, like Penniman, was the site of a World War 1 DuPont munitions plant. In 1891, E. I. DuPont de Nemours bought the land, which had been owned by the descendant of an Irish immigrant named Thomas Carney. DuPont had purchased the 17 square mile tract so that they could build a plant and manufacture smokeless gunpowder. 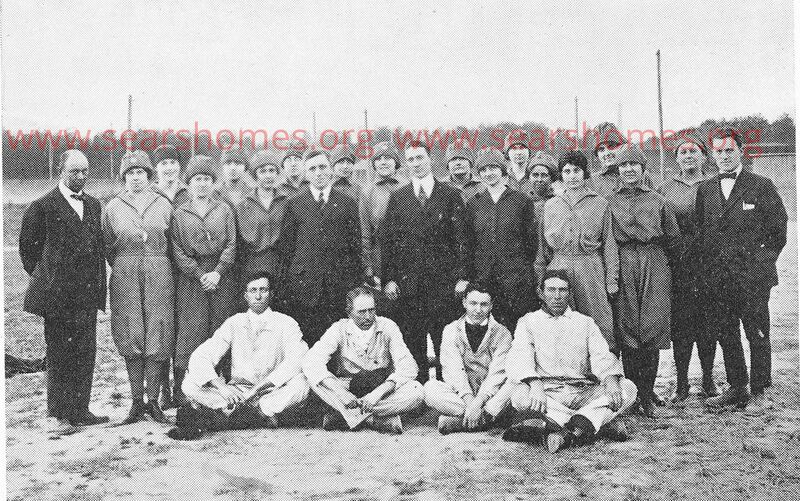 At Carney’s Point, the population swelled from 2,000 (pre-European War) to 25,000 (1917). 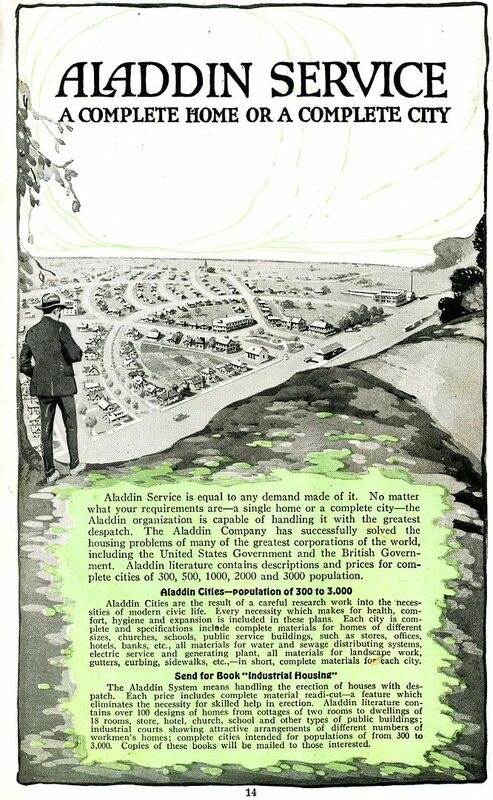 In their great rush to provide industrial housing for all these people, DuPont turned to Aladdin to supply pre-cut houses. 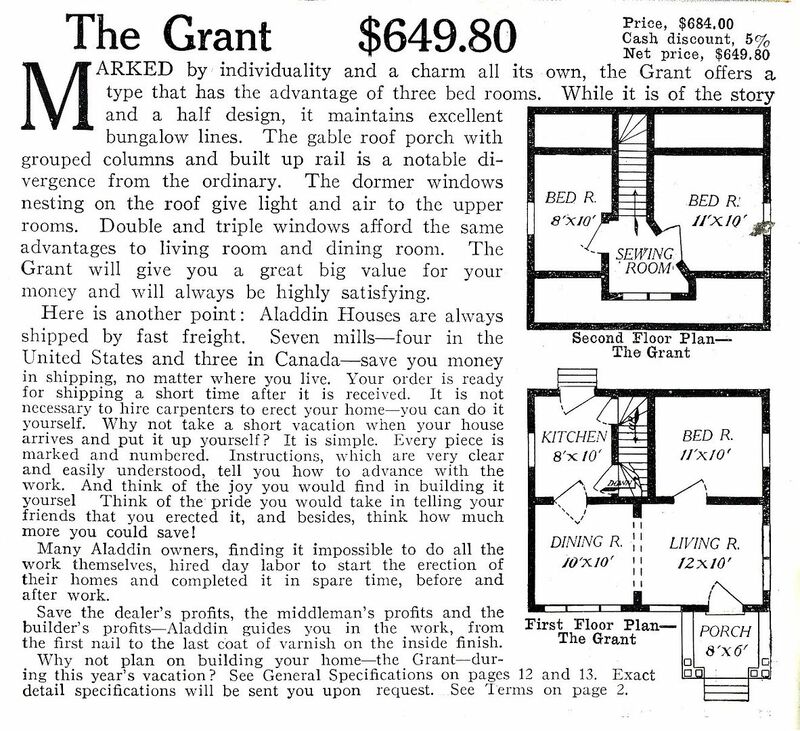 One of the houses that was built in the Aladdin neighborhood was The Grant. This is one Aladdin model that I have never seen anywhere else, and yet there’s a surfeit of them in Carney’s Point. Do you know of a “Grant” in another community? Please leave a comment below! 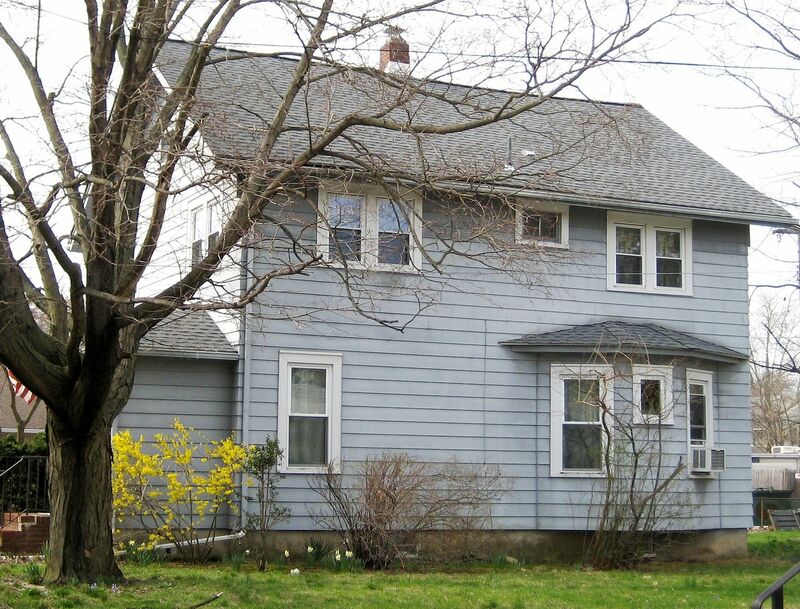 And please share this link on Facebook or with your old-house loving friends! 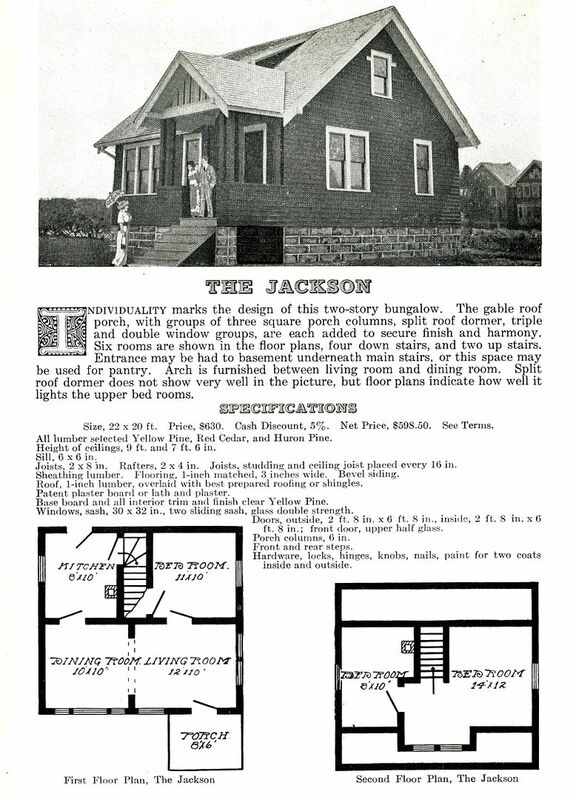 In the 1914 Aladdin catalog, it was called, "The Jackson." I just love the drawn-in people. 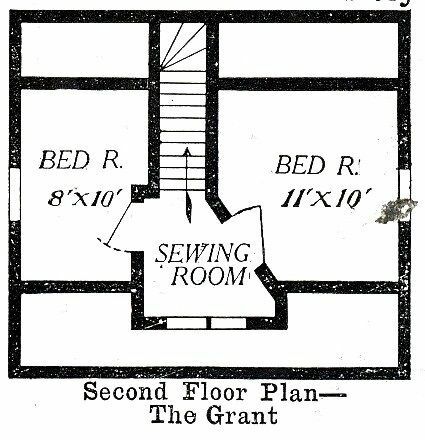 In 1916, the little house was renamed The Grant. 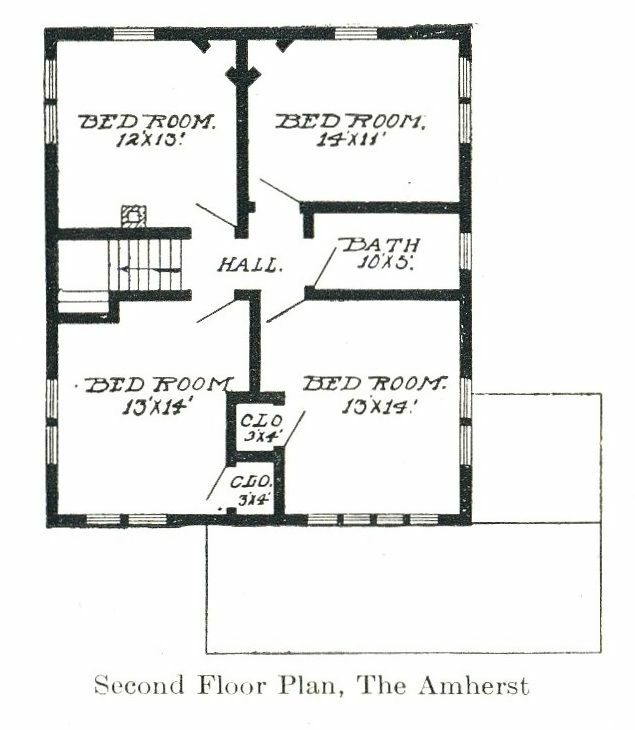 This first floor was 20 by 20 (400 square feet) and had a pretty basic floorplan. 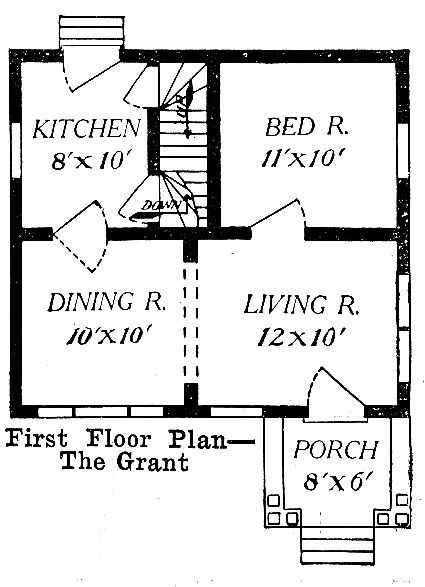 And perhaps most interesting, it had no bathroom (as shown in 1916). Best of all, you can assemble it on your next "stay-cation" (last paragraph). 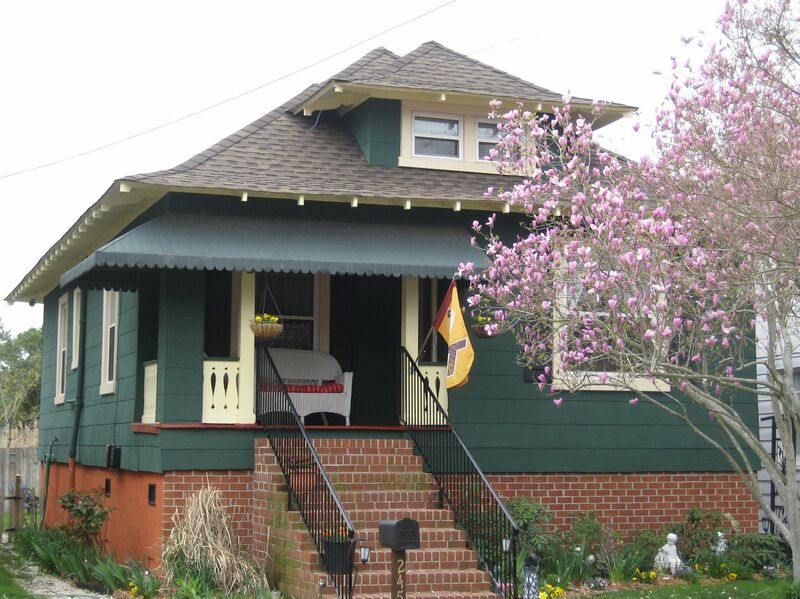 This one is easy to spot with the unique window arrangement and Arts & Crafts porch. 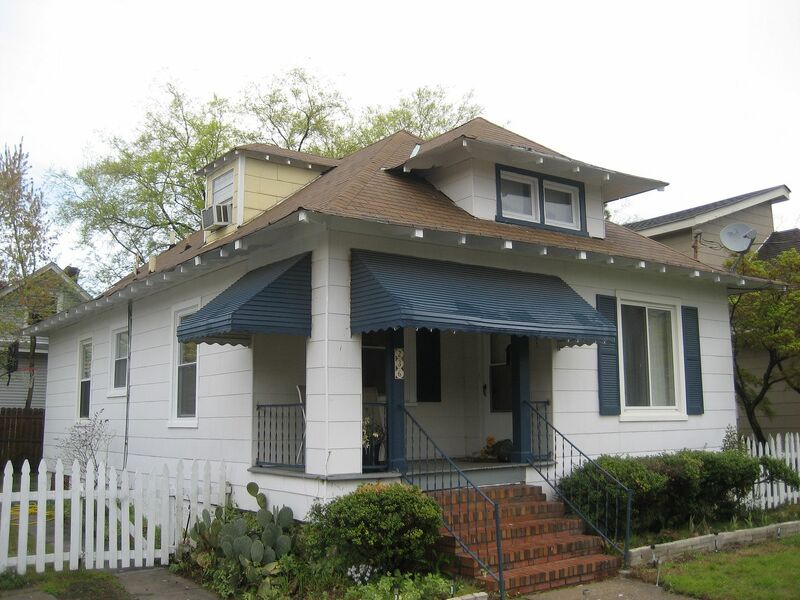 This front porch on this Grant is largely original, but covered in siding and screens. The Victorian screen door isn't a good look, but that's kind of off-set by the 1950s wrouught-iron railing. 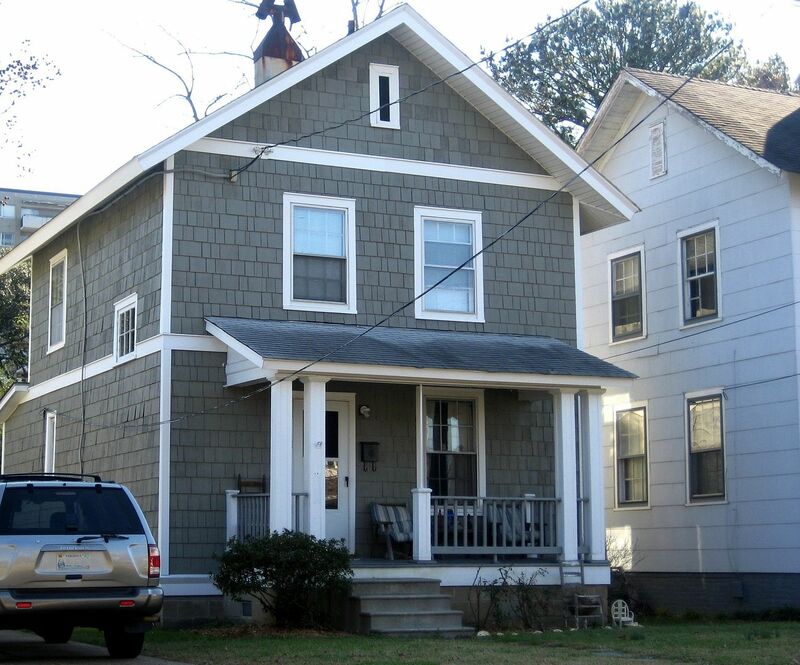 These folks went with vinyl siding instead of aluminum. Plus, it has a beam sticking out of its eye. 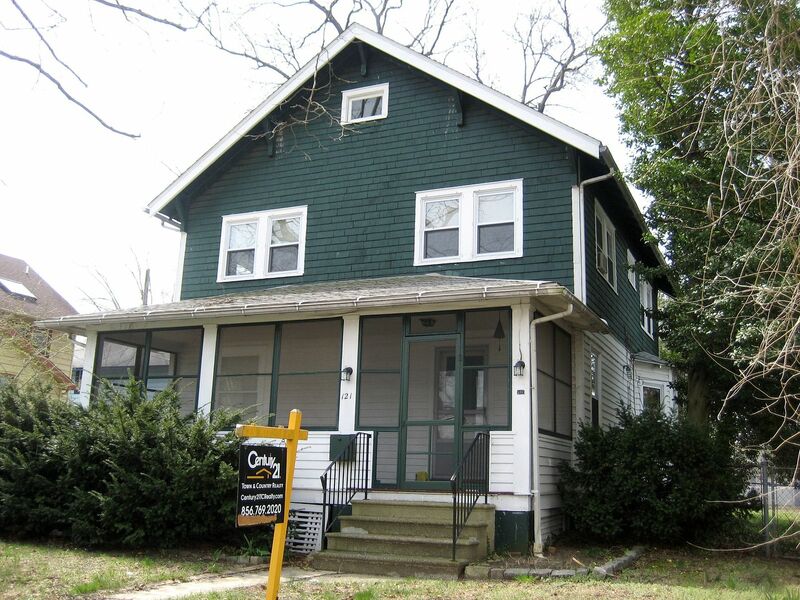 And this darling little house (which also has its original front porch) is for sale for a mere $112,900, which seems like a pretty good deal (assuming that it has an inside bathroom). This was my favorite, because it's untouched by the ravages of roving home-improvement companies and vinyl-siding salesmen. I'd love to know if this is the original siding, or if it was added in later years. 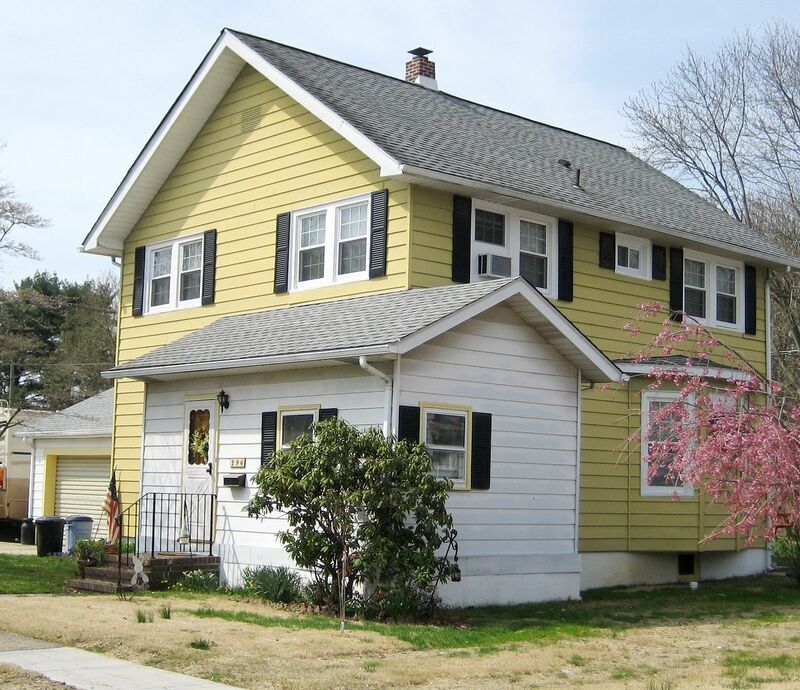 We do know that some of the DuPont designs were offered with "composite siding" which is a nice way of saying, "crappy asphalt roll siding" (which is what we're seeing here). Oh yeah, baby! Original windows! I *love* it! 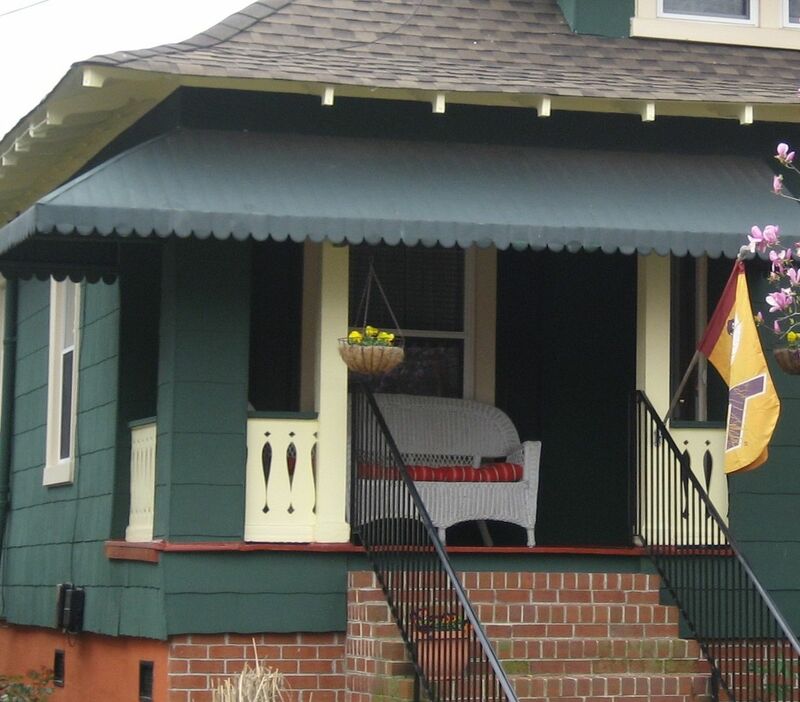 And nice detail around the front porch. 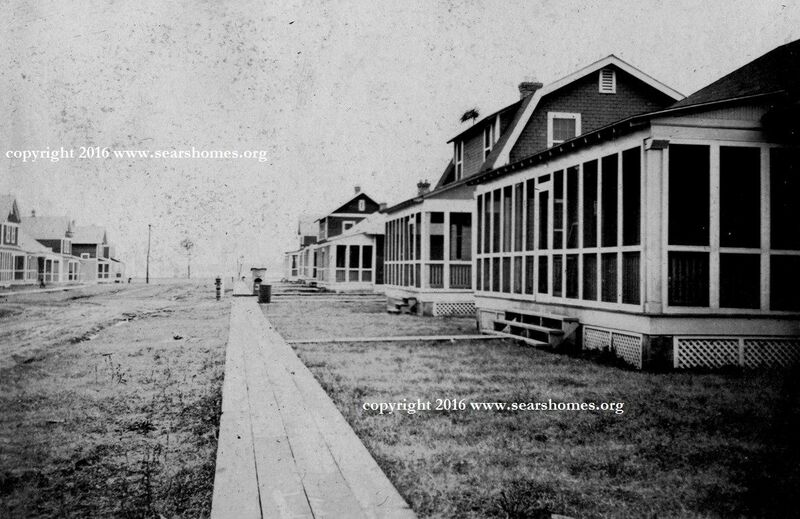 A view of Carney's Point in the late 1910s/early 20s. This photo was taken in the 200-block of Broadway. 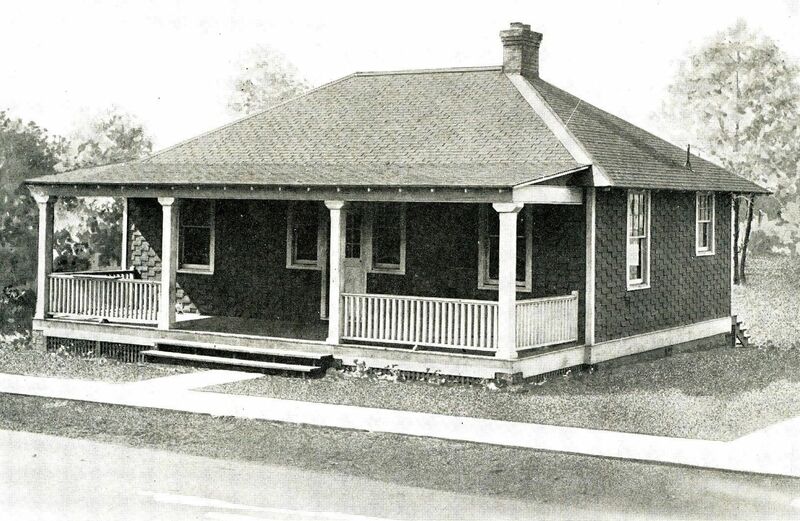 Norfolk is home to 16 of these little bungalows (see below), which were moved to their resting place in Riverview and Highland Park from another location. 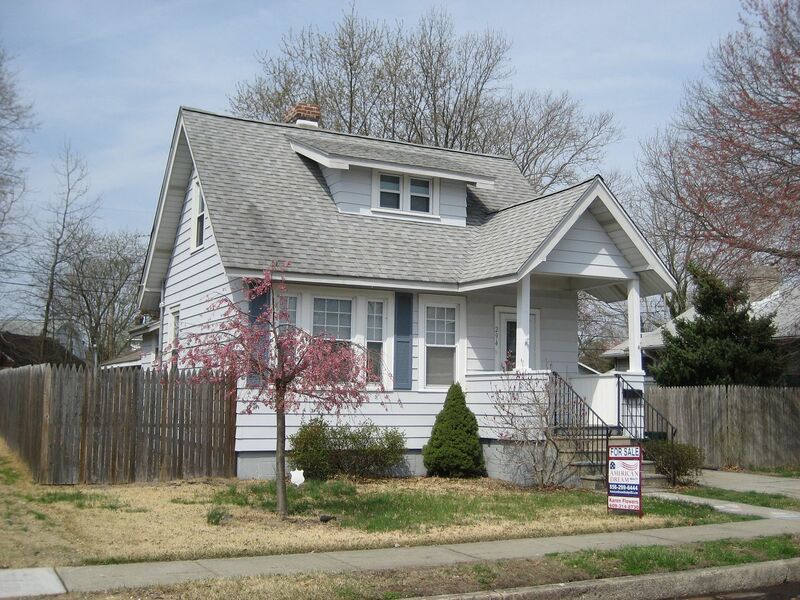 They’re fairly distinctive little houses, and the $64,000 question is, where did they come from? 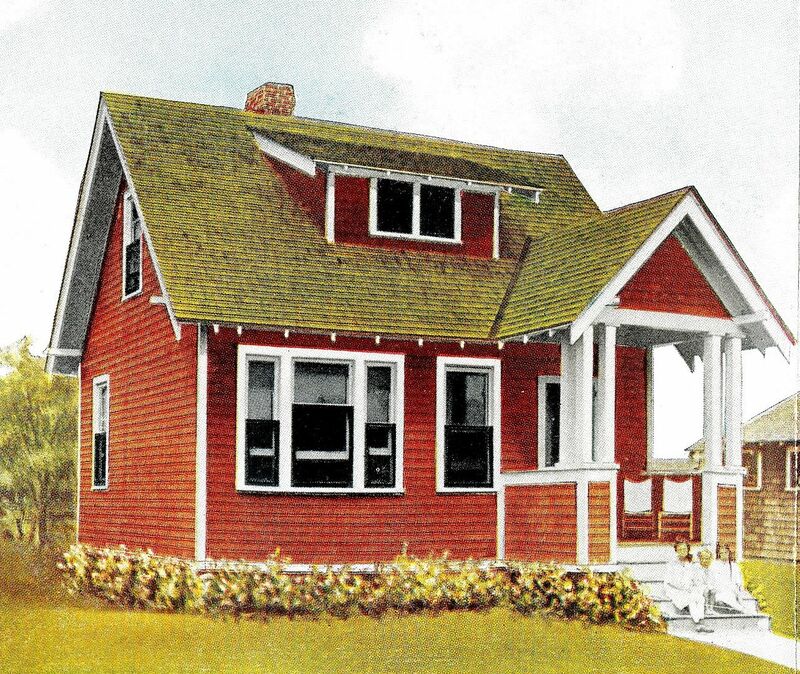 Despite searching throughout my old Aladdin catalogs, I have not been able to identify these Norfolk bungalows as Aladdin kit homes, but it’s possible that Aladdin created some custom designs for these large orders for Dupont. 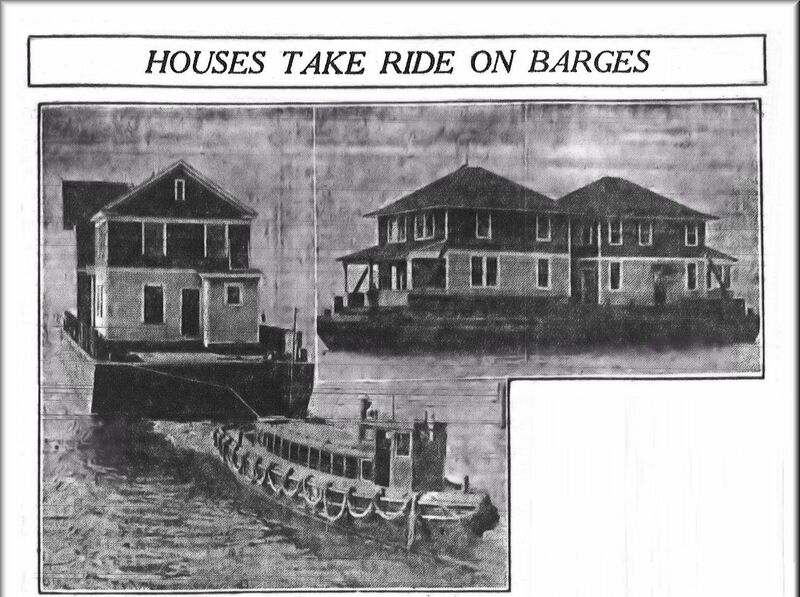 Here in Norfolk, we’ve long heard that our 16 bungalows arrived by barge. That old legend, coupled with the story above, suggests even more strongly that these houses were part of the 600+ houses that Dupont ordered from Aladdin sometime in the early 1910s. Now it’s time for me to go to Williamsburg and see if I can find the rest of the collection. 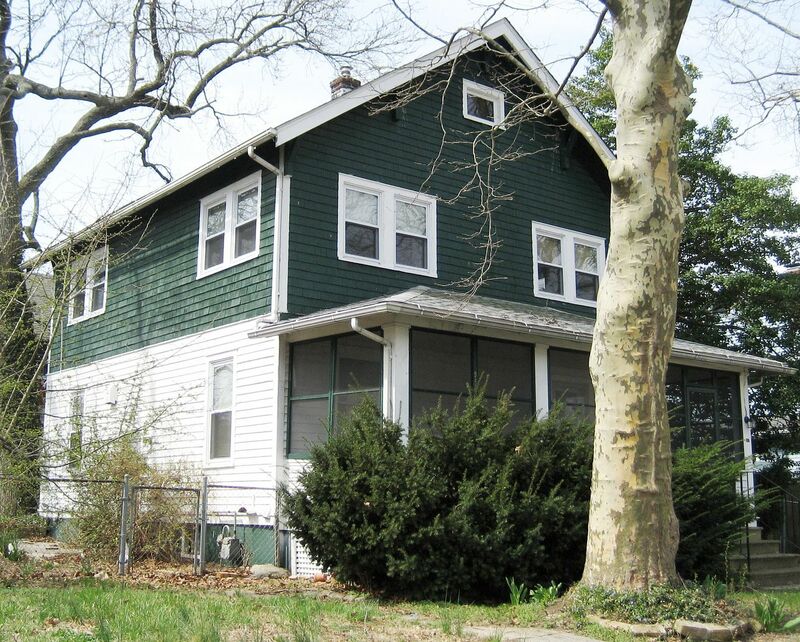 If anyone has any idea where I might start find early 1900s bungalows in Williamsburg, I’d be grateful to hear! If you’ve any information to contribute, please post a note in the comment’s section below! One of our mystery bungalows on 51st Street. Photo is courtesy of David Spriggs and may not be reused or reprinted without permission from David Spriggs. 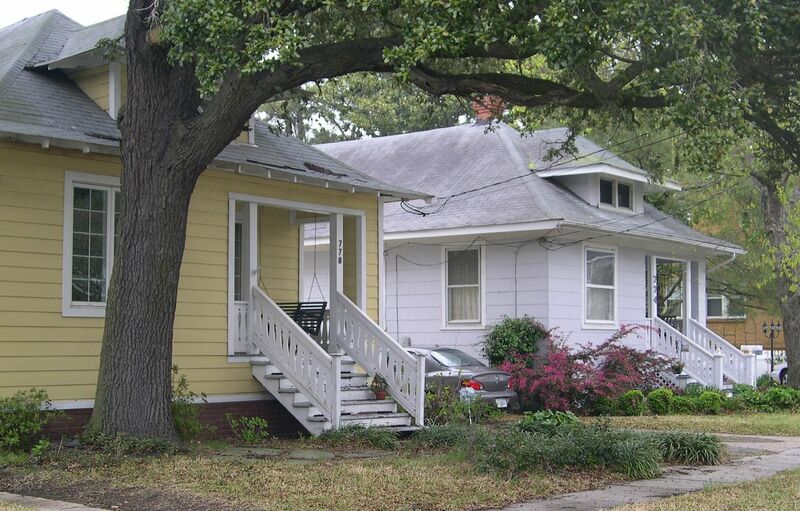 Good shot of the two bungalows on 51st Street. This photo is courtesy of David Spriggs and may not be reused or reprinted without permission from David Sprggs. 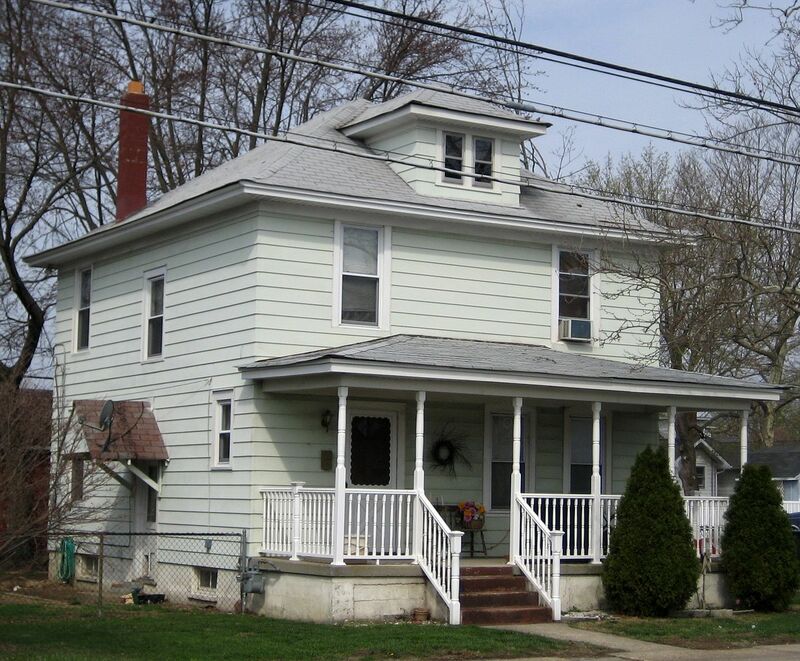 This is one of the houses in Riverview that's in mostly original condition. 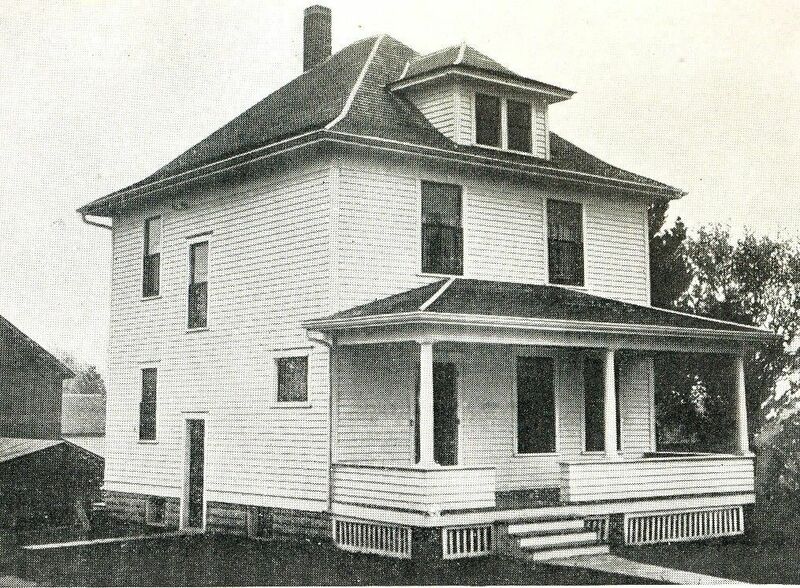 The little dormer on the side was added in later years. 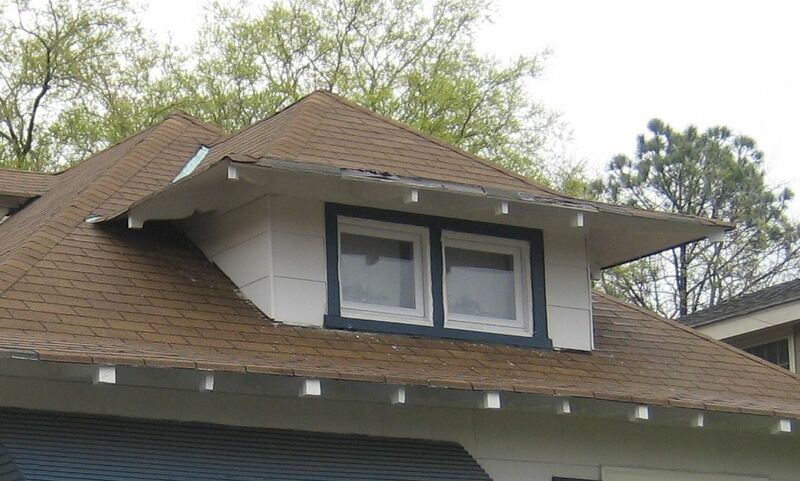 This dormer window is a pretty distinctive feature. Close-up of the original porch railing. 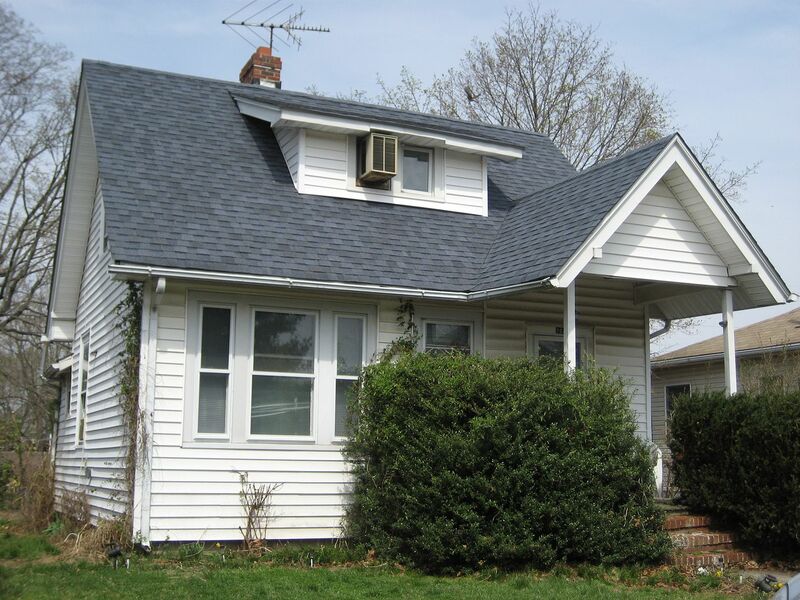 To learn more about the kit homes in Norfolk, click here.